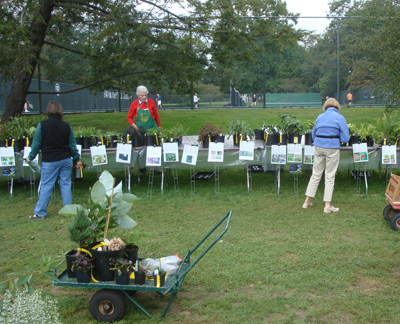 Have you ever wondered how Scott’s biennial Plant Sale is put together? You might be surprised at how much time and work is required to make a three-day plant sale go off without a hitch! More than a year before the sale, an army of dedicated volunteers begins working with the staff to organize the event. The primary goals: to make available to local gardeners a unique selection of plants; to raise money for the Arboretum; and, of course, to have fun! But, sourcing and selling interesting plants is only part of the story. We want to help people make beautiful, successful gardens, and that begins with helping them make informed choices. Here is a look at how the plant sale team strives to help every customer walk away with not only great plants, but also the knowledge they need to succeed. This sometimes perplexes new gardeners. Why is that long, unpronounceable Latin name needed? It’s a good question, and the complete answer is a subject for another post. For now, suffice it to say that those complex Latin names are actually full of useful information, and the unique name assigned to every species helps you know exactly what plant you are dealing with. This is the first step to making a good choice and then providing your new baby with the conditions it needs. There are several excellent databases for botanical names, but two of the most user-friendly are The RHS Plant Finder http://apps.rhs.org.uk/rhsplantfinder/ and Tropicos, the Missouri Botanical Garden’s database http://www.tropicos.org/. Both of these sites allow you to enter either a common name or a botanical name for your search. Although using common names can give confusing results, if it’s all you have to go on, at least it is a start. A good place to start is the Scott Arboretum library! This little library is packed with books, journals, newsletters and popular gardening magazines. It is located on the first floor of the Arboretum offices and its online catalog can be accessed at: http://www.librarything.com/catalog/ScottArboretum. 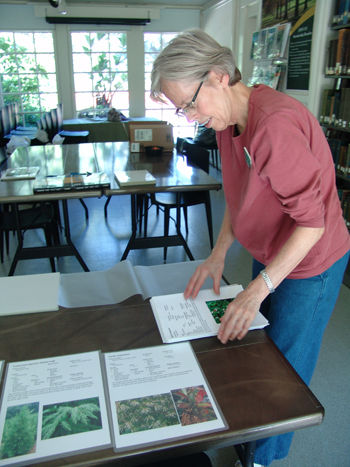 There are many, many online resources for plant information, some more reliable than others. The Education Committee notes that hardiness zone information, especially that provided by some retailers, should be used with caution. After all, their goal is to sell plants, so zone range may be overstated a bit. Also, simply using cold hardiness as a guide does not tell the whole story of a plant’s needs. Factors such as soil type, rainfall, and heat tolerance, to name only a few, are important, too. So, dig a little deeper! Look particularly for sites originating in your growing area, such as PHS www.pennsylvaniahorticulturalsociety.org. Other good resources include www.conifersociety.org and www.mobot.org; university and cooperative extension sites like http://pubs.ext.vt.edu/, http://www.ces.ncsu.edu/depts/hort/consumer/ and www.hort.uconn.edu/plants; and specialty nurseries such as www.siskiyourareplantnursery.com, www.terranovanurseries.com, www.northcreeknurseries.com and www.plantdelights.com. Learning about plants is almost as much fun as growing them. Gathering information will give you a good head start on creating a beautiful and satisfying garden, whether it’s a few pots on the patio or a few acres around your home. This was a great article for sources and resources. It would be neat to see sources for photos of plants as well. Thank you for your continued excellent plant education!